Olivier and herring under a fur coat might be among the most recognizable of the country’s salads, but this relatively unknown number is guaranteed to light up any table (especially over the festive period). My granny was the first in our family to make this salad about a decade ago. At that time one of our relatives worked in a restaurant and shared the recipe, which became extremely popular among customers. My granny still keeps the card with the salad formula, which she always follows. She says back in the day it was something absolutely new and modern: She had never cooked anything like it before. “Wood grouse’s nest” salad is unique due to the way it is presented: In the form of a nest (as you might have guessed). However, it actually has nothing in common with a wood grouse as it’s made from chicken and ham - it got its name simply because a grouse is more festive. Today there are plenty of variations of the salad: Some people add cucumber and cabbage to make it healthier, others prefer to cook it with beef tongue instead of chicken fillet. For it to be a “wood grouse’s nest” salad though it does need a few staple ingredients, including French fries, which are used as the twigs in the nest. And of course handmade “eggs” are also added so it looks ultra realistic. My family absolutely adores this salad and we make it for big holidays: It really requires some time and energy. But it’s completely worth it. Here’s my granny’s special recipe - try it out for yourself. First of all prepare your French fries: Cut potatoes into very thin strips and fry in a pan with plenty of oil until golden-brown. Lay the fries on some paper towel to get rid of the excess oil. Next, boil the chicken fillet and finely chop the meat. Grate the carrot and fry it. Then chop the onion, sprinkle it with some vinegar, and lightly fry as well. Cut the ham into thin stripes, chop the pickled mushrooms, and grate the boiled egg whites. Mix all the ingredients together, season them with salt and pepper, and dress with a generous amount of mayonnaise. Lay out some lettuce leafs on the plate and shape your salad in the form of a nest leaving a hollow in the middle. Don’t forget to save some French fries for the decoration! To make the “eggs” finely grate boiled egg yolks, garlic, and processed cheese, add some chopped dill and mayonnaise and mix everything. Then form small “eggs” from the mixture and put them in the center of your salad. 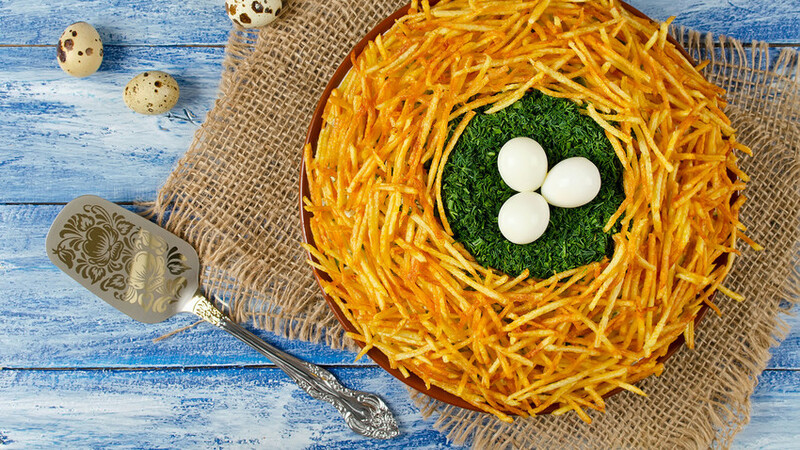 Finally, shape a nest from the remaining French fries on top of the salad. And there you have it. 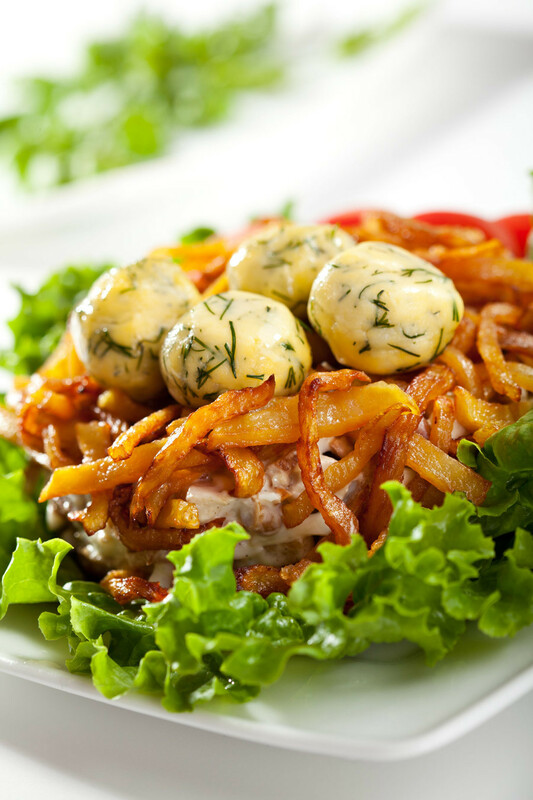 Don't forget to take a look at twelve Russian dishes that you'll either love or hate.